It is that time of year to have your home blessed by Father John. Download the form below and drop it in the church basket, or mail to the church. The Faithful of Archangel Michael Parish celebrate the Feasts of Feasts, the Holy Day of Holy Days, the Resurrection of our Lord. 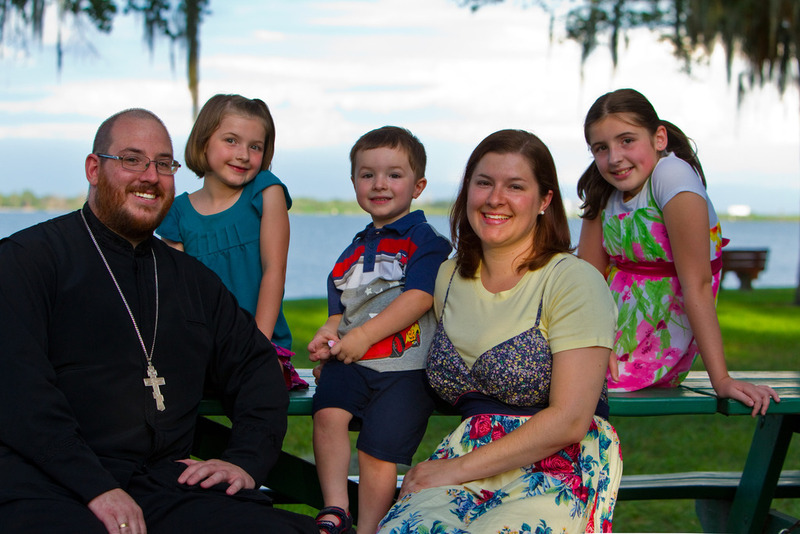 On July 1st, our parish welcomed our new Associate Priest, Fr Joseph McCartney. He is joined by his wife Maura, and children: Anna, Sarah and Justin. Fr Joseph recently graduated from St Tikhon's Orthodox Theological Seminary in South Canaan, PA. St Michael's is excited to have Fr Joseph and look forward to him getting involved with our youth and other groups. 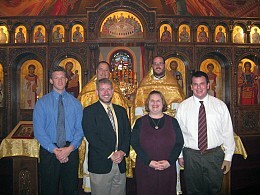 St Michael's Parish warmly congratulates our new catechumens, Matthew, Jason, Christopher, and Amanda. We are all praying for you as you take this step closer to being joined to Christ's Holy Church! On Sunday after Liturgy, St Michael's Parish held its first annual Cleveland Browns Tailgate Party, and it was a huge success! Those that attended enjoyed football, fellowship and our All-You-Can-Eat & Drink Menu, which included burgers, dogs, chili, baked beans, potato salad, chips, dip, popcorn, apple cider, soft drinks, and beer. 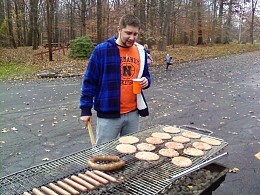 We look forward to next year's Tailgate event! Nov. 26-27th Fr. Joseph and several parish youth attended a Youth retreat hosted at St. John the Theologian Monastery in Hiram, OH. The Youth talked about Prayer and forming a relationship with Jesus Christ. They also attended the services of the Monastery, helped the monks move firewood, and talked with the Abbot of the Monastery, Archimandrite Alexander. 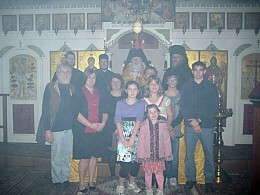 On Sunday, Dec. 5th following the Divine LIturgy, St Michaels Parish held its annual Christmas Yolka. 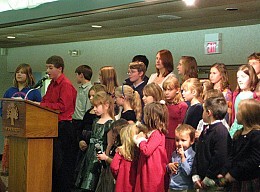 Over 200 parishioners enjoyed the banquet and various plays put on by the Sunday School classes. Guests also participated in gift basket raffles and live music, courtesy of St Michael's talented youth! Archangel Michael Parish celebrated the Nativity of Our Lord in joyous style this year. Following the Festal Divine Liturgy we had a wonderful luncheon in our church hall. A great time was had by all. Christ is Born! Our beloved rector, Fr. John, turned 50 this year. Archangel Michael Parish had a luncheon following the Divine Liturgy in which we honored Fr John. The parish also gave Fr John a GPS system as a gift. Many years Fr. John!